Because everyone judges a book by its cover. What do you want yours to say? Note: If you're reading this on your phone, be sure to switch to web site view so you can access the other pages that includes the gallery, FAQs, and pricing information. How did I come up with the name, Book Cover Diva? I was hashing out the particulars of my new venture with a friend when I had mentioned in passing that while I’m very low-key about my writing, I am a dyed-in-the-wool-diva when it comes to design. I pick through stock art like Versace chose fabrics. I know almost immediately when something looks right. It’s part instinct and part training. It’s knowing the trends without clouding the aesthetics. If I come across as picky and obsessive about your cover art it’s because I want it to wow your audience. There’s a subtlety to cover art. It’s more than splicing two pictures together. It’s being able to tell a story and share a moment. If you follow me on my author blog (MariaZanniniHome.com) then you already know I’m an author, a homesteader, and a dog lover--not necessarily in that order. What many people don’t know is that my first vocation was graphic design. I’ve designed logos, advertising, and point-of-purchase merchandising. I worked for a large telecommunications company until I relocated to the country where I quickly discovered I wasn't cut out for long commutes. What could I do so far from any metropolitan area? I had designed a couple of book covers for my own self-published books. Almost immediately, I started getting requests to design other covers. I had turned them down, but now I wonder--had I been hasty? Was there a need for someone like me? There was only one way to find out. As an author, I’ve been in your shoes. I understand how daunting it is to encapsulate a whole novel into one thought. As a graphic artist, I will guide you through the process. When you commission me, you are working with me. Not some big company or a cookie cutter outfit that stamps out covers by the dozens. I talk to you, and more importantly, I listen. I’m not going to wedge in every bell and whistle from the book. I’m going to create a cover that delivers a promise to the reader. If you take nothing else away from this introduction, remember that good cover art creates an emotional response. It's the reader's segue into another world...the one you created. Please visit the rest of this web site. Email me at (CoverMe AT argontech DOT net) and ask questions. If you like what you see, let’s talk. 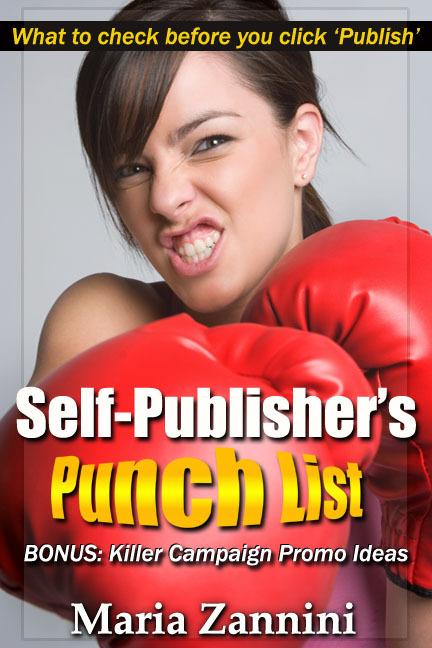 Self-Publisher's Punch List is now at Amazon. Pick up a copy for a list of tips on what to do before you click publish, and an honest heart-to-heart about the various promotional venues available to you. If you liked the book, I hope you'll leave a review. Copyright © Maria Zannini of Book Cover Diva. No part of the content on this web site can be used without written permission. All rights reserved.